Making quilts for boys is challenging. Can I get an amen?? And I never have quilts suitable for guys laying around in my quilts to gift stack. Case in point. Around Christmas time, I told my niece she could come pick out a quilt. She came over with her husband, and her two children, Jenna and Jeffrey, to decide what one she wanted. She left with two because she couldn't decide and her darling Jenna left with one, too. There stood sweet Jeffrey. I felt so bad that I didn't have one that he would like so I promised him I would make him one. That's when the challenge comes in. Trying to decide on fabric and what would be a great boy quilt that wasn't babyish. This is what I came up with....I think he will like it, don't you? The backing fabric is by 3 Sisters called Passport. 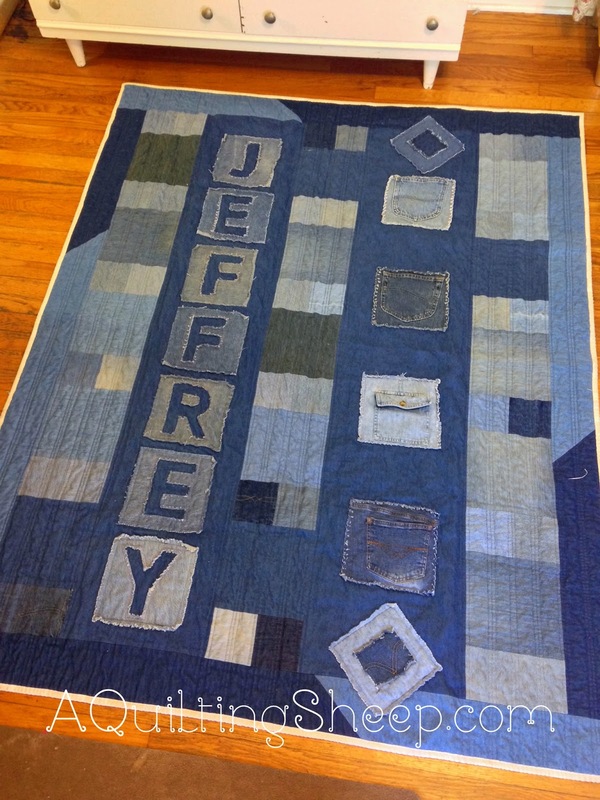 We had just gotten in the shop last week and I knew that was the perfect backing for Jeffrey's quilt. I can't wait to give it to him!! Have a happy and warm Wednesday!! I love the backing fabric! Is that supposed to be former British colonies? Oh, man! This is perfect for a boy! Love that you included his name on the quilt and the addition of those pockets. They really add interest and are fun features! It's a HIT! Oh, YES ! That is a wonderful quilt for ANYONE, but most especially a boy/young man ! Oh Amy, you did a wonderful job. You made sure, he knew it was custom-made just for him! That is a fabulous boy's quilt. Jeffrey will love it! This is such an awesome quilt! I am certain he will feel it was worth the wait! Yes - it's a fun challenge coming up with an appropriate design for a boy's quilt. This one is wonderful! I really love the mix of ruggedness and creative play in the denim patchwork. Fantastic back for it, too. Fab-u-lous!! He will love it! Who wouldn't?? GREAT backing fabric! Saw a small pic of the quilt on my Blogger dashboard and thought it was a Dr Who phone box at first! LOL, but yes, Jeffery should love it, and will probably not outgrow it for a while. Great job on your design! Here's an Amen, and a Hallelujah for this awesome quilt. 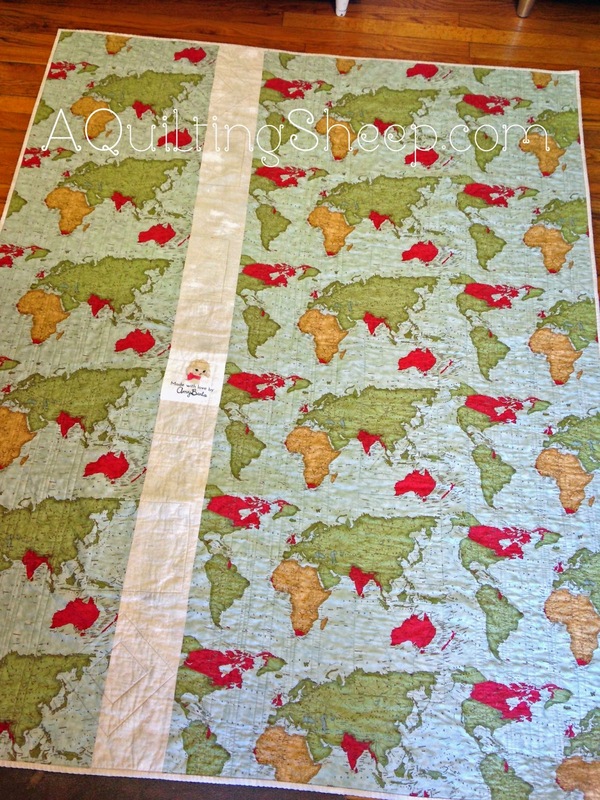 Great idea for a quilt for a boy. Love the name and the pockets too, and the backing fabric is perfect. I always think denim or wools or flannel for males. I love your denim quilt. Fantastic job! I do believe Jeffrey is going to be one happy boy! It's incredible! love that you used recycled jeans. You are very creative and have a great eye. Keep inspiring us all! Amen! Soooo hard to make quilts for guys. I have done it but you have to stop and think about it. You did a great job it's a great design. I made my nephew a denim and flannel rag quilt. It is hard to come up with masculine quilts! Your turned out great! PERFECT!!!! I also love that Passport fabric - that was the perfect backing for it. You are so clever, my dear! That's one fantastic boy-quilt! Well done! Modern Building Blocks- top is done!